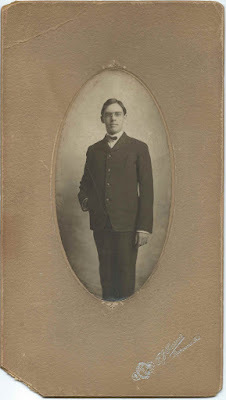 1903 photograph of a young man who may have been William Elmer Rupe and which he might have used as a vehicle to propose marriage to his future wife, Merle (Williams) Rupe. The photograph, which was taken by the F. J. Parsons studio of Richmond, Indiana, measures approximately 5-1/4" by 2-3/4". Matted, the piece is approximately 9" by 5-1/4". The reverse contains a message in code that appears to be "Feb - 18-1882. 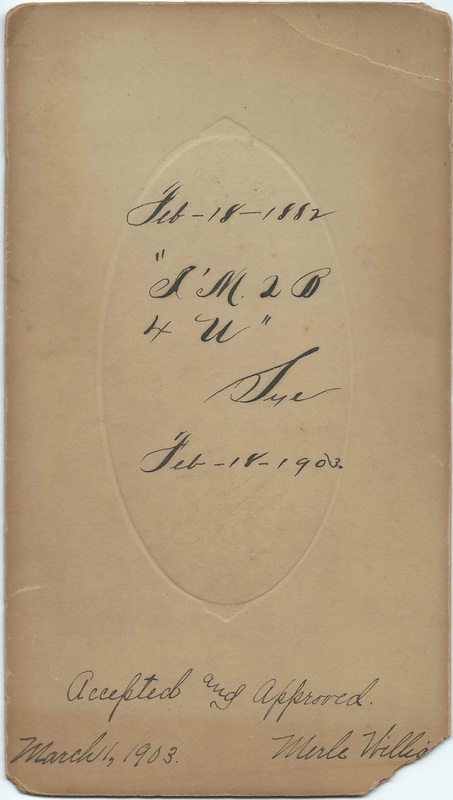 I'm to be for you, Sye, Feb-18-1903"
Merle W? [part of the lower corner is missing, so the name could be Williams or Willis or ? Interestingly, Willard Elmer Rupe was born February 18, 1882. February 18, 1903 would have been his 21st birthday. Perhaps this photograph was the way he delivered a marriage proposal to his future wife, Merle (Williams) Rupe. Willard Elmer Rupe was the son of Judson R. Rupe and Isabel (?) Rupe, "Belle". On January 11, 1905, Willard married Merle W. Williams, daughter of Frank and Eva Williams of Richmond, Indiana. Willard died in 1868 and Merle in 1974. They're buried in the Earlham Cemetery at Richmond, Indiana - you have to search for all Rupes in the cemetery in order to bring up the memorial for Merle W. (Williams) Rupe. If you have corrections and/or additions to the information above, or if you feel that the man pictured is someone else, please leave a comment or contact me directly.